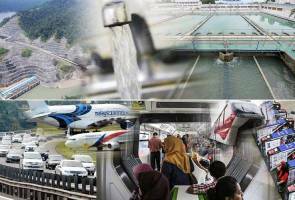 JOHOR BAHRU: The state government has urged the federal government to focus on water and public transport issues in the 2017 budget to be tabled on Oct 21. Johor Menteri Besar Datuk Seri Mohamed Khaled Nordin said improvement to public infrastructure should be done as it is assessed by prospective foreign investors. "In terms of road infrastructure and network, Johor is satisfied with the help and cooperation of the federal government," he told reporters, here today. Earlier, Mohamed Khaled officiated the opening of Bukit Amber Elevated Interchange on the North-South Expressway (NSE), here, today. Also present were State Public Works, Rural and Regional Development Committee chairman, Datuk Hasni Mohamad. Mohamed Khaled said Bukit Amber Elevated Interchange links Senai Airport City and Bukit Amber with the NSE to Malaysia-Singapore Second Link, Johor Bahru and to Singapore. "It also links Senai-Desaru Expressway to Pasir Gudang for easy access to Tanjung Pelepas Port and Johor Port.